Scientists tell us that to meet that goal, we must immediately and quickly reduce the use of fossil fuels. What we do in the next decade will determine our foreseeable future. The gas emissions that cause global warming remain in the atmosphere for centuries, so once we put a certain amount of them into the atmosphere, the damage is done. Waiting too late to act is, literally, too late. To effectively decrease emissions from fossil fuels, we cannot produce more of them than we do now, and we should quickly reduce those that produce the most emissions. In Canada, this means the tar sands. Yet our prime minister tells us it is in Canada’s national interest to build the Trans Mountain pipeline, which will enable a huge expansion of the tar sands. Such an expansion will mean that Canada will not meet its international commitments to fight climate change. Canada will continue to be part of the problem, not the solution. The Conference Board of Canada has written that between 1990 and 2015, Canada’s total emissions have increased by 17 per cent, with tar sands leading the way. Apologists for Canada’s fossil fuel interests tell us that Canada’s contribution to climate change is just a few per cent of world emissions, so it’s no big deal. However, except for a few huge countries like the USA, China and India, most other countries only contribute a few per cent. This is why every country must do its part. Regardless of Canada’s national contribution, its per-person contribution makes it consistently one of the top three countries in the world. Each Canadian produces two to three times as many emissions as someone in the European Union or China, and 10 times as much as someone in India. The Pembina Institute tells us that if Alberta were a country it would have the highest per capita emissions in the world. So how can the enabling of tar sands expansion be in our national interest? Candidate Trudeau convinced many voters that it was in the national interest to combat climate change, to seek “true reconciliation” with First Nations, to look for “social license” from those bearing the burdens of resource development, and to rollback the use of the draconian state security apparatus created by the Harper government as the enforcement arm of fossil fuel interests. We will use the coercive power of the state on our own people, who are simply trying to protect their lives and futures. Perhaps worst of all, it will set a precedent that threatens the principles of confederation, by having the federal government usurp all the processes surrounding resource development from the provinces, and use taxpayer money to support a project over the wishes of those who must bear its burden. Prime Minister Trudeau may want to remember why many voters selected Candidate Trudeau, many of whom voted Liberal for the first time, in desperation to defeat Harperism. The prime minister says the pipeline was the necessary bargaining chip for getting a carbon tax. If true, then the PM is indeed a poor negotiator. One doesn’t negotiate away core principles, values and promises for a tactical advantage. The carbon tax will not make up for the pipeline’s damages, but memories of the ease with which the federal Liberals jettisoned their promises and principles will remain. Finally, is it even in Alberta’s interest to stay dependent on a substance that, by necessity, we must stop using? Better to deal with that reality now, while there are still other options. Despite all the voices telling us to beware, it is only the corrupting voice of oil money to which our main political parties seem attuned. 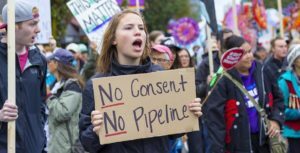 It is in the national interest to stop both that voice and this pipeline. Posted in: Clean Energy, climate change, Pipelines.